Southgate's standing soared as England reached a first World Cup semi-final for 28 years in Russia this summer. "We'd like him to stay beyond 2020," said FA chief executive Martin Glenn. "I think we'd both like that, but if we talked about it at any length it would then be a contract conversation and he's on holiday now – so we'll talk when he comes back." Southgate's salary is understood to be £1.8m a year, with performance bonuses taking it closer to the £2.5m his predecessors Sam Allardyce and Roy Hodgson are believed to have earned. 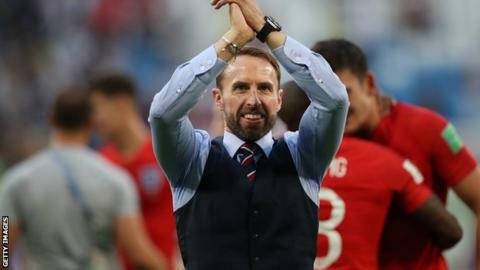 Asked if he was concerned that Southgate's success with England will attract lucrative offers from clubs, Glenn said: "I want to pay my staff competitively so they are not a flight risk, but I also recognise we are a sports governing body and we're not a Manchester United. "We can never compete with the Premier League in terms of pay – everyone knows that. "At some point, Gareth may choose that he wants to try something different and we'll find someone else." Glenn's admiration for Southgate is clear, with the chief executive saying he "blossomed" in Russia and referring to him "as the definition of the modern manager we want". "Gareth is on a journey," he added. "He loved the World Cup and he's built his own belief that we can go further and that motivates him and [assistant manager] Steve Holland. "One of the most powerful things he said after our defeat by Croatia was we haven't done the job. We want to be a top 4 team, one of the best, so it's unfinished business."